​​Welcome to SAY WHAT? !, a one of a kind, no-holds barred storytelling and comedy series right here in Phoenix! 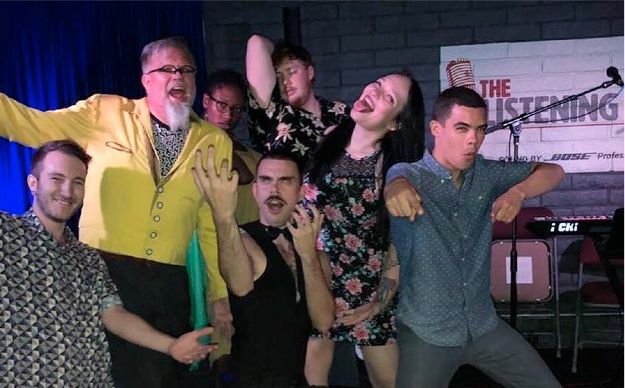 With a focus on LGBTQIA+ performers, our goal is to not only entertain, but also to provide a stage for queer performers to share their experiences with an audience of interesting and cool people (like you, dear reader!). Do you enjoy real-life stories told by talented and charismatic people? We like it so much we organized a show! Are you looking for a Valentines date this year? We don’t guarantee a love connection will happen, but who knows maybe it will! Come celebrate our (almost) 1-year anniversary AND an early Valentine’s Day with us as we get ready to tell stories that we probably shouldn’t be saying in front of a live audience. Featuring: Trejon Dunkley, Ernesto Ortiz , Courtney Wahlstrom, Raymond Howard, and host Cole Travis. With visual art by Alexis Lopez and live music by local drum and piano powerhouse duo Vintage Clothes.